Do you love painting? Do you love wine? 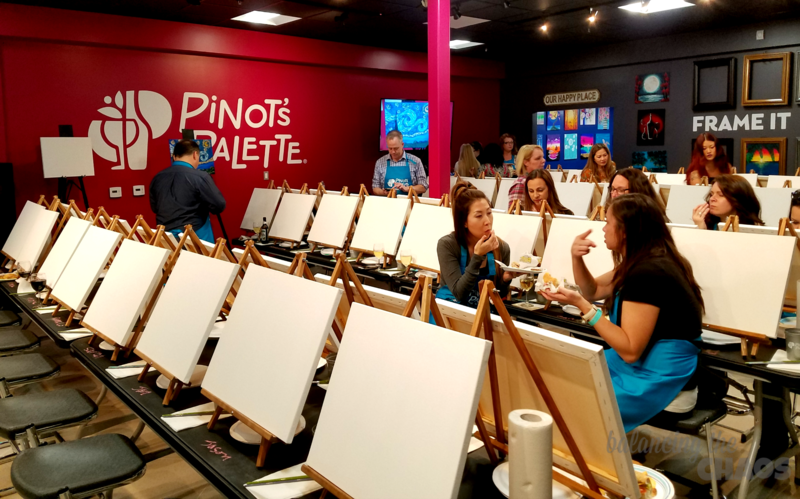 Pinot’s Palette just opened their newest location right here in Aliso Viejo – Orange County. 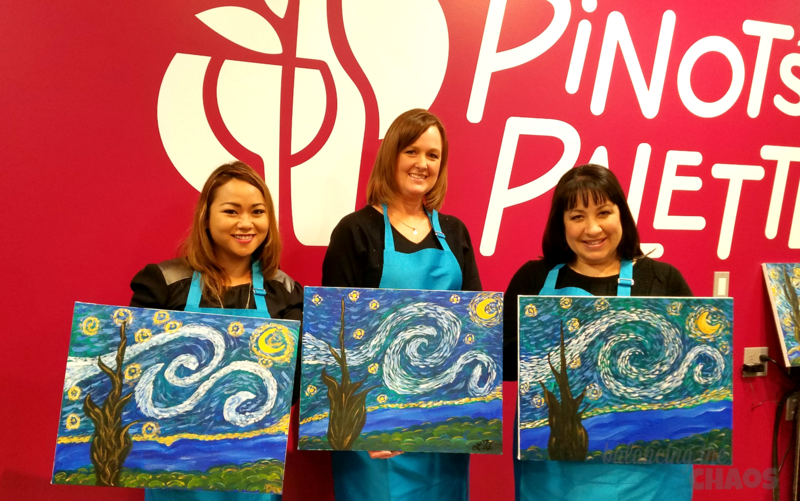 If you’ve been looking for something fun for a night out with the girls, or just some quality time with a loved one, it’s time to plan a night of fun at Pinot’s Palette that offers fun instruction on painting beautiful master pieces while relaxing and enjoying yourself. We were invited to the soft opening of the Aliso Viejo location last week, and had a blast. As soon as we walked in, we were invited to place our belongings into their cabinet along the wall so as not to get acrylic paint on everything. Then we were pointed in the direction of the bar. We were told to grab a glass of our favorite beverage and find a seat amongst the easels. I kept hearing it from my friends, “I don’t know how to paint!” At Pinot’s Palette, you really don’t have to know how to paint. All you need to do is follow the directions of the skilled instructor and a master piece appears before your eyes. 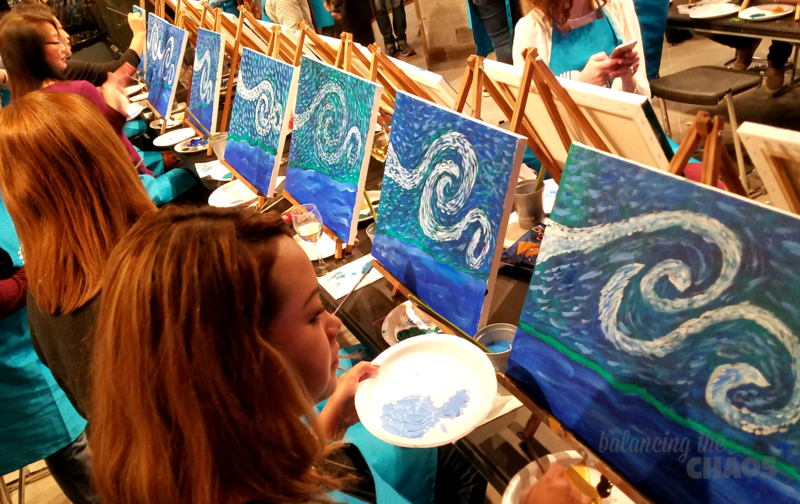 Their step by step process, combined with a little fun, great music and cocktails made painting our own Van Gogh possible. The studio is located at the Aliso Viejo Town Center on the second floor above Stadium Brewing. Stairs and elevator at the back of the building. Plenty of parking available in the plaza parking lot. Current Southern California (Orange County) Locations include: Aliso Viejo, Brea, Rancho Santa Margarita, Tustin and Huntington Beach opening soon.